The Russian-French Mistral Class helicopter carrier saga has been a long and rocky one. Originally the two amphibious assault ships were built for Russia, with many Russian combat systems installed, but France denied delivery after Russia seized Crimea a year and a half ago. Since then, many potential customers have been identified for the ships, but Egypt appears to be where these powerful ships will call home in the not so distant future. The Mistral Class are pretty amazing ships. Not because they offer any sort of new capabilities that other amphibious flattops don’t, but because they offer a lot of capability for their price, costing around $700 million each. They also have much lower their operating costs when compared with say an American Wasp Class LHD, which only enhances their reputation for value. With this in mind, many navies around the globe looked at buying the orphaned ships, many of which are not known for carrier operations or for large navies for that matter. Canada, NATO, Brazil, India, Vietnam, South Korea, Saudi Arabia, Netherlands, New Zealand, Singapore and even China and the U.S. have been floated or rumored as potential buyers. In the end it appears that France has brokered a deal with Egypt for both the ships. France has become a more heavily favored nation for Egyptian trade and arms deals in recent years as it has been in the past. The el-Sisi government has pivoted away from the U.S. as its main strategic partner in the region as the Obama Administration has greatly chilled the Egypt-U.S. relationship because of the military backed el-Sisi coup that seized power from the democratically elected Muslim Brotherhood. As a result, F-16 and other arms deliveries were temporarily embargoed to Egypt, which among other things, disrupted the once strong relationship between the two countries. In Washington’s absence, Egypt has turned to France and Russia for arms sales, with major orders being penned worth billions of dollars for Dassault Rafale and MiG-29 fighters recently. Meanwhile, Egypt has been engaged in a deepening counter-terror fight against extremist elements, namely those aligned with ISIS. Geographically speaking, threats are emanating primarily from around the Sinai Peninsula, which Egypt worries could one day endanger the Suez Canal, and from the western border with Libya, which is embroiled in a full-on civil war and teaming with Islamic militants. Even with the rising spectre of Islamic extremism looming over Saharan and portions of sub-Saharan Africa, it is not exactly clear what Egypt plans on doing with two amphibious helicopter carriers. These powerful ships could be used as seabases of sorts, parking them off the coast of trouble spots on the Mediterranean, Red Sea, and Arabian Sea, but that would signal a massive expeditionary shift in Egypt’s foreign policy. Although maybe this shift has been underway already, with Sunni Arab states openly fighting Iranian backed Houthi Rebels in Yemen. In fact, Egypt and Saudi Arabia have joined forces to a certain degree militarily to attempt to shape the region as they see fit. This is known as the Cairo Declaration, and it was signed with little western media attention this summer. The addition of a pair of aircraft carriers and amphibous assault ships could provide a counter-balance against increasing Iranian influene in the region. If anything else, the purchase is a major sign that Egypt plans on becoming much more active when it comes to regional military operations than it has in the past. Also of interest is that these ships were originally meant to be delivered to what is becoming Egpyt’s prime global ally, Russia. Russia, who was denied purchase of the vessels, has stated that it will build its own ships of similar capability. But Russia doesn’t necessarily have the shipbuilding ability to do so. Even though Russia has in-depth knowledge of the Mistral Class and its systems, building an entire one alone, without even a working example to go off of may be troublesome. Additionally, Russian sub-systems were never gutted from these ships after the original deal was cancelled and they remain an integral part of these ships. These systems will need servicing and upgrades, and sailors will need to be trained on them throughout the ship’s life. In other words, Egypt will need some cooporation with Russia when it comes to operating these ships. While it is speculative in nature at this point in time, all this may lead to a unique situation where Egypt allows Russian accesses to their Mistral Class ships, and joint use of them for common foreign policy interests. Operations such as the one Russia is undertaking now in Syria comes to mind. This would also allow Russia to gain further knowelege of the ships design and operations. With two examples in the hands of a close ally, Russia and China could work together to build a similar class. China could use such a capability and is in need of aircraft carrier design know-how. Additionally, they have gone down similar “unconventional” routes before in order to obtain new naval capabilities. Namely buying the rusting hulk of an aircraft from Russia for use as a Casino under a shell company before rebuilding it into their first fixed-wing aircraft carrier, the Liaoning. The Zubr Class hovercraft deal is even a better example. In the end such a deal would benefit Egypt, Russia and possibly China, while at the same time allowing Russia to work around the embargo that left the two Mistral Class ships on the liquidation block in the first place to a certain degree. 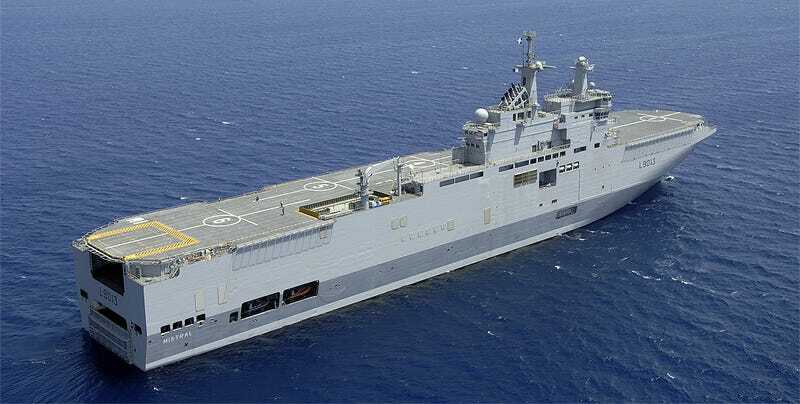 It is reported that both Mistral Class ships will be delivered in March to Egypt after a force of 400 Egyptian Navy sailors are trained to operate the ships. The total price of the deal is said to have been worth $1.062 billion dollars. That may be less than what Russia was going to pay for the two ships, but just keeping them in port was costing the French between about $1 million and $5 million a month depending on who you ask, and that number was only rising as the ships weapons systems and sensors would need upgrades and its mechanical systems deeper maintenance from disuse. It will be fascinating to see how these powerful Swiss Army Knife-like ships will change the balance of power, and even the perception of naval capabilities in the region. And it will be especially interesting to see how much involvement Russia will have with their capabilities and operation.